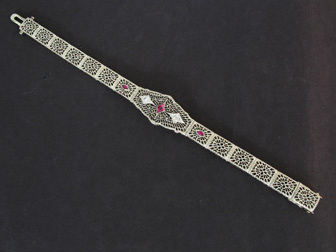 Description: Elegant and hightly detailed 14K white gold bracelet linked bracelet with sapphires and green onyx set into reverse etched camphor glass. 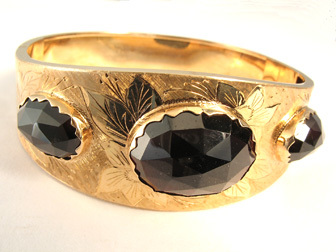 Style/Date: Contemporary Materials: 14KY gold over sterling silver, peridot Description: Very handsome and solid open bangle cuff with 3 gold bezel set peridots and parallel lines extending down the sides. Style/Date: 1930's? 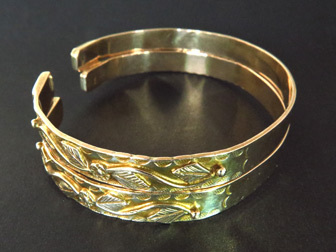 Materials: 14K yellow gold Description: Pair of open cuff bangles with complimenting applied foliate design and hand chasing. Open space on front for engraving names possibly. 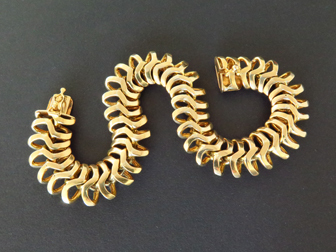 Style/Date: 1970's Materials: 18K light rose gold Description: Unusual flat snake like link bracelet. Feels as smooth as butter!